The Icons & Relics Collection of Pyrgos houses a collection of priceless hagiographies, wooden sculptures, metal art works & other items for ecclesiastic use. Most of the exhibits date back to the 17th & 18th century. 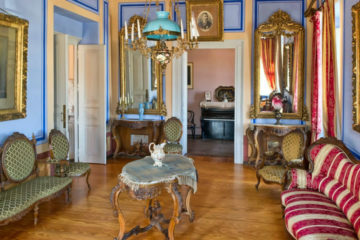 It also hosts displays on shoe making, printing, candle making, wine making and typical local food. The oldest icon of the collection has the portrait of Agios Georgios and is dated back to the 16th century. 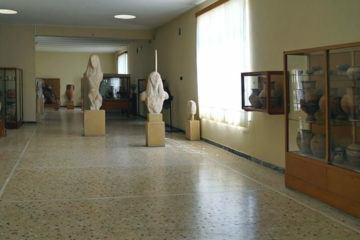 The museum can be found in Agia Triada church of Profitis Ilias Monastery in Pyrgos. The ticket price is €2 (reduced ticket €1), while there is free admission for students of EU member states and persons up to the age of 18. 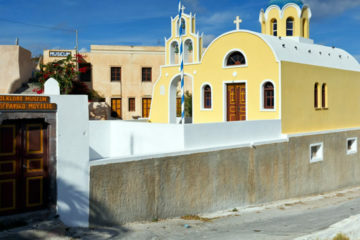 It is worth buying a 4 day ticket that costs €14 (reduced €7) and allows the entrance in Pyrgos’ Icons and Relics Collection, Archaeological Museum of Santorini, Prehistoric Town of Akrotiti, Ancient Thira and Museum of Prehistoric Thira.